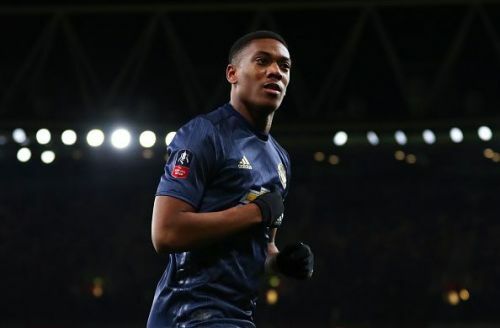 Manchester United winger Anthony Martial will not feature against Crystal Palace, as he hasn't recovered from the groin injury which kept him out against Liverpool. United are going to face Crystal Palace on Wednesday night in a game which could be pivotal to their top four hopes. According to English outlet Independent, the United management is unwilling to risk the Frenchman for the trip to London tomorrow. Martial has scored 9 goals in the Premier League for United this season. The same report has also claimed that the Red Devils are going to face Palace at Selhurst Park without 10 first-team players. Ole Gunnar Solskjaer's side are set to miss Ander Herrera, Juan Mata, Jesse Lingard, Marcus Rashford, Nemanja Matic, Antonio Valencia, Matteo Darmian, Phil Jones and Marcos Rojo for this midweek match. We’ve not had a session yet so I don’t think there are a lot of positives, no. I don’t know the list that’s supposed to be injured. Matteo trained the other day, I don’t think he’ll be ready. Marcos Rojo will be involved, Rashy we’re still waiting to see how his ankle is responding to the treatment, muscle injuries are too early to think about. That’s it. Martial is not going to be ready for this one, either, we can’t risk it. So maybe Southampton [on Saturday] but we’re not gonna risk anther one. The kids are joining in today. They’ll be involved in the squad. They’ve been part of our training for a long time now. They’re ready, the kids, it’s a hard if you’re a defender coming as a 16- or 17-year-old but as an attacker you just go out there and express yourself, and there is your chance. They can win you the game not lose it for you. United will be looking to get three points from this midweek game as any kind of blunder could hamper their chances of getting Champions League football. There are still a few superstars available in the United squad who will be expected to step up and shine for the Old Trafford outfit.